I'm not winning ... yet. I believe CR's right, he's got the highest overall score so far. As far as I was aware, $100 USD is cheap/average for an 8800GT ... if they sold here for £70-80, or whatever the equivalent of $100 is in GBP, I'd be ecstatic. £96 would still be an acceptable price for the UK actually, I just checked and I can find a 9800GT (same card) for £87, but that's a fluke - usual price is £120 or more. Edit: again, my 1337th post - I'm leet! Hehe noticed that. Congrats. Your the fist time I've even seen a user with it active. Someone needs their eyes checked, computeruler, is miles ahead. It takes 15 years to become an overnight success & Windows 10 will add another 10 years to it. To think, that someday, someone will always outdo me. Computeruler can be a showoff at times. Let him gloat for a little while. He'll settle down and soon figure out that nobody really cares what his score is, just that now we can all see what our own computers got on the test. No doubt in my mind..................... it is! I have a 2.3, you have a 2.5! See the difference? And my gpu is horrific! 2.4 My gpu is horrific too! Captain - could you post your specs, or even better, edit them into your profile, so we can see what hardware you have? I <3 newegg too! Very nice system you got there. Makes me feel old and outdated and I want a new one. Also, wouldnt it be about the same price to just gt a 2tb hard drive? probably right, but the transfer speeds are much faster with 4 drives on RAID 0. Also, I originally built my system two years ago, and have since replaced all but the keyboard, mouse, case, and... Hard drives There might have possibly been 1TB drives available at that time, but if so were very pricey. 320s were the most bang for the buck at the time. Been serving me well or they would have gone the way of the EVGA motherboard that I quickly came to loathe which now sits collecting dust in the closet lol. hmm, i'm 64 bit and didn't have any issues. Ah, there we go. It will run on 64bit. Yeah definately not worth damaging the hardware, you're getting great results with what you're already doing. I'm making this thread a sticky since most new SBCC members miss it and it's always interesting to see benchmark scores (at least I think it is). Seeing as this is now a sticky, I thought I'd try it out....and pass everyone else out. Oh, and it runs fine on 64 bit. text doc says it all really!! Results look excellent kpac and Stats look. Looks good camerongray thanks for sharing. Well for what it's worth here's mine on a 2 week old self build, 1st windows computer ever. They are in there somewhere. I'm just trying to amend my profile so they show up under specs. There we are. They show under specs now. If I over-clock they'll get better wont they? Just thought I would bench my rebuild. Not the best score in here by any means. My memory score could be higher if it was running at its rated speeds, also my CPU score could be higher as I can bench at a much higher clock than I currently run 24/7, but to get my system 100% stable at 3.2GHz requires a large jump in voltage, above that speed it will not pass Linpack but is stable for all other intents and purposes. The rerun of the benchmark certainly shows the difference from my older build, but I'm really not sure why the OGL score dropped just over 10000, it may be that this test doesn't use my newer card to its full capabilities and perhaps benefits more from the higher shader clock of my older 8800GT - just guessing, as some apps are like that. Who said you could back here and beat me? I have upgraded the hard drive so I could probably improve with that. I really need a new Graphics card. I ran it fine on XP X64, I believe others have run it under newer X64 OSes too. just tested my main computer i use for my projects. its not over clocked yet and i know i can push it a lot more but just not worth the time right now...maybe when i get back into 3d rendering again i will. Looks great bloob thanks for sharing. 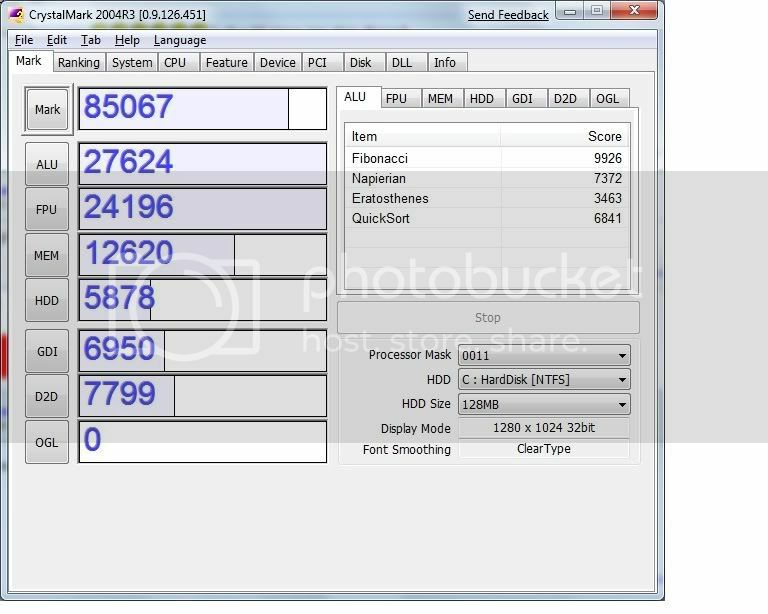 bloop, could you post the specs of your machine so we can see what the scores relate to? 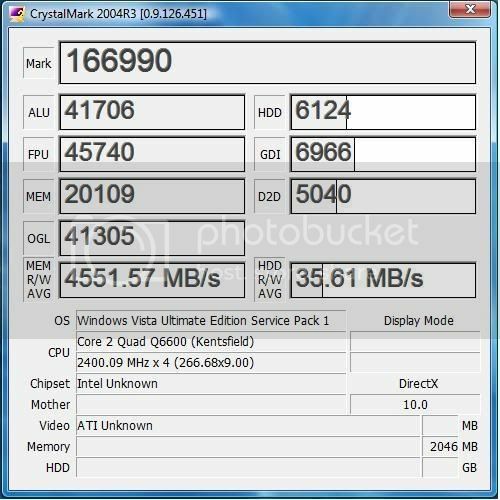 Benchmarks from a new PC I built for my uncle. 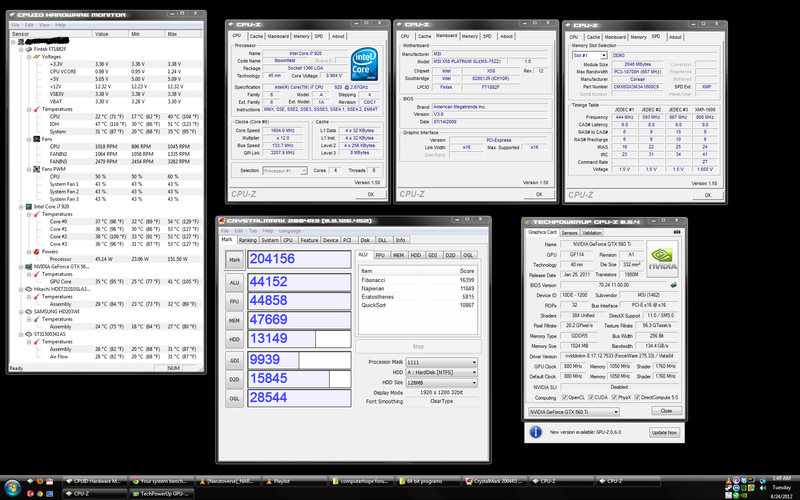 I spent a bit of time having fun with overclocking and testing this - did I mention hw much I LOVE i3? I got it much higher, even on the stock cooler, but without raising the graphics voltage a fair way the integrated graphics weren't stable under full load. 3.6 is a nice conservative clock, actually done on lower than stock voltage so the temps are still very cool. 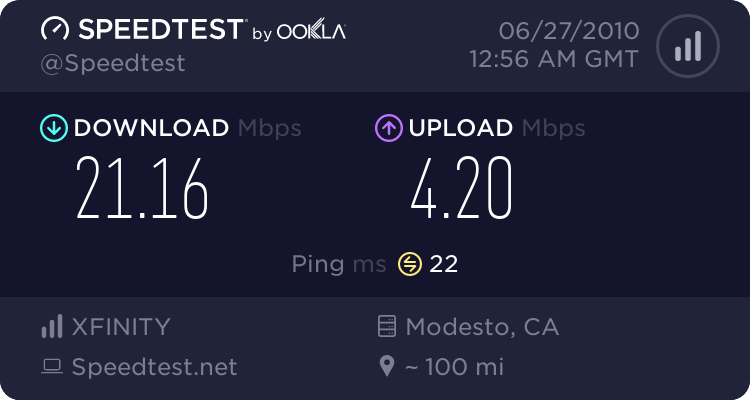 Ignoring the onboard graphics instability under load, I pushed to 3.8 with the same voltage - this is a very good chip, and I know for a fact it could go further. If I'd used a separate graphics card, thus disabling the onboard graphics, it probably would have gone to 4.0 - with an aftermarket cooler, even a very cheap one as the i3's put out very little heat, I could have gone further, as I could with better RAM. For reference, maximum temperatures after a full 12 hours of Linpack were 65C - this is way above any other load anyone can put on a processor, and while running CrystalMark's CPU benches it didn't break 50C. I love i3. Very nice. Like the comparison pics. Gives a good comparison between them. The results are somewhat strange, though - see how the graphics benchmark scores have increased, although the graphics core speed has remained the same? 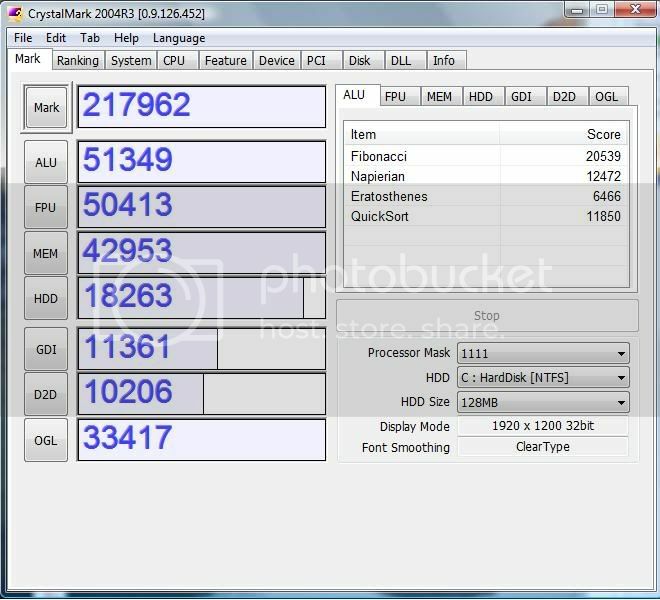 Shows that CrystalMark's graphics tests are rather CPU dependent. Also, the memory score has gone up ore than I'd expect, for saying at stock clocks the memory is at 1333MHz and at the overclocked speed it's at something like 1396MHz, somehow this has given nearly a 4000 point increase. I can only assume the memory part of the benchark is also rather CPU dependent. Just goes to show the relationship between the components I guess. Nice stats, look good. I helped you out and deleted one of your posts. Thanks again for sharing. Any comparable benchmark tools for us Linux users? That's a great question and sorry forgetting the Linux crowd. I hope to see more Linux related questions so I can amp up the Linux support on Computer Hope. I mainly focus on Windows since that's what most users have. I welcome any other Linux benchmark suggestions, but from what I've read HardInfo and Phoronix are the best. I'll give those a shot. In CrystalMark2004, I hit around 157,000. This was while having a few torrents, flash videos, and applications running, though. Will give these all a test later on an idle system. What benchmarks are used for SPARC64 and PowerPC systems running FreeBSD and OpenBSD? All parts are at their factory setting, not overclocked and the GPU not unlocked (yet). Here's a rather amateurish video of it http://www.youtube.com/watch?v=IJ9xcFcezAU&feature=channel_video_title please thumbs up if you like! "Knowledge is cheap at any price"
I got 204156. with load of apps running- I ran the benchmark on a whim. I would probably see better marks if I didn't have anything running. certain programs such as Dropbox (for work) uses CPU/disk all the time. Bittorrent uses disk & network. Got VLC Media player running (watching Naruto), then there's Chrome, steam, log me in, and finally Vista's wasteful system resources hog. suppose if I took the effort and inconvenience to turn everything off, I'd probably get better scores. 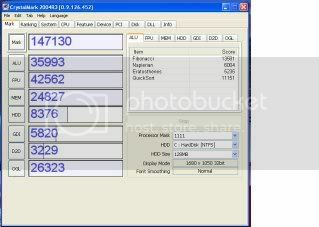 Image shows all system specs as well as programs running in background @ time of test. Computer name blocked out to protect my personal info. Also system temps- either this benchmark isn't very heavy on resources or I've got excellent cooling that can handle all loads. when I first built this PC there were some temps concerns- at full load in stress tests CPU temps would hit 75C and IOH would top 90C. temps are much lower now... although I've yet to do a 100% load stress test. What's the most standardized for win7 ult 64? Although this is an old thread, I thought I may as well update it with the results for my current PC. 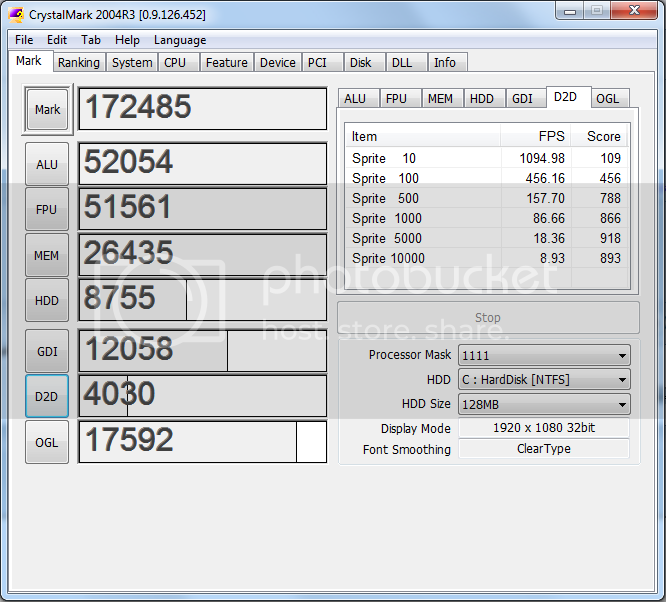 Was thinking that it may also be a good idea to create a new thread like this with a newer benchmarking utility as I'm not sure how much CrystalMark2004 will take advantage of modern hardware. Also note that although Speccy shows the CPU clock as being 3.5GHz, I actually have it overclocked to 4.3GHz with Turbo Boost up to 5.25GHz.